“Normally, a new oil well gushes” the article continues. 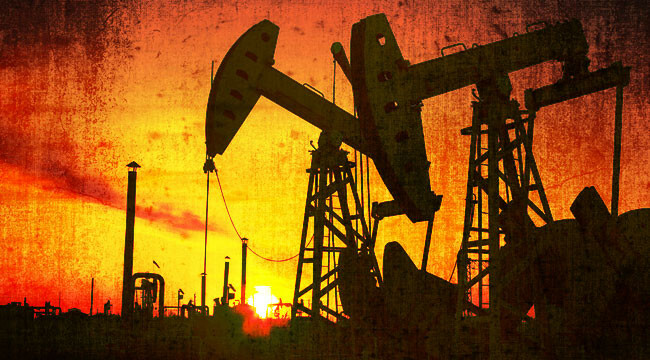 If you’re well tapped into the oil market, it’s possible you’ve read this article from Time. Then again, the article above was penned in October, 1951. Again, this quote has the dust of nearly 62 years on it. And if that “tremendous pressure” needed to crack the Spraberry formation sounds a lot like “fracking” — that’s because it is! However, the technology used back in the 50s quickly proved to be a flash in the pan. The recovery rates for many of the promising Spraberry wells weren’t high enough to be profitable. Flash forward 60 years and the groundwork is laid for today’s unexpected shale bounty. After digging into the archives, it’s amazing how similar today’s oil boom is to the boom in the 40s and 50s. Back then wildcatters were delineating the best plays — from North Dakota… to Denver… to Oklahoma… to Texas. They knew America’s fertile soil was underpinned with gooey pockets of oil. And in true free market fashion, the hotspots were quickly established. The hotspots in the Spraberry yielded many barrels of oil, but nothing compared to what was left behind. By the late 50s and 60s enhanced oil recovery (EOR) was taking place on the once productive sweetspots. Meanwhile the “source rock” for these sweetspots lay dormant. That is until recently. Rigs are spinning away in shale hotspots — North Dakota, Texas, Oklahoma, Colorado and more — and the companies with the best deposits and most efficient drill plans (modern day wildcatters by my measure) are cashing in. The Permian Basin’s Spraberry formation is back in the limelight — and finally set to live up to those 1951 expectations. What makes this time different, you ask? Is the recent boom in the Spraberry doomed for the same pop and fizzle as the 50s? Can the U.S. production gains keep chugging along at this breakneck speed? According to recent data, the answer is yes. In fact, one oft-forgotten precursor is pointing to even more production in the coming years. The boom that many wished for in the 1950s — as seen in the excitement of that 1951 Time write-up — is happening today. Up until now, though, we haven’t covered one important precursor to booming production — it’s not rigs, it’s permits! Indeed, whereas rig count gives us a good idea of where the money is flowing and from where the production is coming (since some of these deposits were shots in the dark at first), now we can narrow down our scope and see just how many permits are being approved for the targeted hotspots. Permitting for all three major hotspots is WAY up since 2009. Also, excluding a potential (estimated) drop in North Dakota’s permits for this year, it appears that the Eagle Ford and Permian are chugging along. With permit activity as our guide we can expect to see a lot more oil production GROWTH in all three of these basins, but some more than others. Today, as a follow-up to our recent write-up, I’d like to revisit the opportunity brewing in the Permian Basin. Recently we discussed the massive production potential for the Permian Basin in West Texas. In short, this American energy hotspot is stacked with production zones. The most important (so far) of those up-and-coming zones is the Spraberry. As we highlighted above, it was once called “the world’s largest unrecoverable oil reserve.” It’s about a thousand feet thick and sits 7,000-8,000 feet below the surface. But without stimulation, like hydraulic fracturing, this thick shale bed isn’t economic. In fact, it’s important to note that the Spraberry (and the Permian) is different than other U.S. shale plays. As noted the shale is relatively thick, in some cases 1,500 feet. With that type of pay-zone drillers can cut costs by planning vertical wells, instead of more expensive horizontal wells. It’s all about economics — and so far the vertical Spraberry wells are paying off the best. This is the same strategy I saw Chevron Corp. (CVX) use back in 2011, near Midland, TX. Here we are a few years later and the vertical wells are still the drill plan of choice. Truly, new technology over the past few years has cracked the code in the Spraberry — just look at the production stats. Production from the Spraberry has been surging. From around 50,000 barrels per day (bpd) in 2004, daily production is now tipping the scales at 225,000 bpd. The way the permits are lining up, the boom is far from over, too. For now keep an eye on this profitable trend in the Permian. The 1951 excitement is playing out in front of our eyes. Ed. Note: Every day, Matt brings readers of his Daily Resource Hunter email edition the most up-to-date news on the resource and energy sectors, including 3 opportunities to discover real, actionable investment plays. If you’re not getting the Daily Resource Hunter, you’re missing out on the full story. So don’t wait. Sign up for FREE, right here.